Lucite International is the world's largest producer of acrylic monomers, and the company's plant in Darwen, England produces high quality acrylics for use primarily in bathroom and kitchen fittings. The plant formerly relied on a Honeywell PlantScape Batch control system that ran on Windows NT4 servers. Due to the difficulties of maintaining this legacy system, Lucite opted for its replacement. Through this change, the company aimed to achieve continuous improvements in the areas of plant safety, worker health, environmental protection, and cost performance. Toward this end, Lucite evaluated the system reliability, lifetime support, and engineering capability of various control system vendors and decided on a Yokogawa CENTUM VP solution. 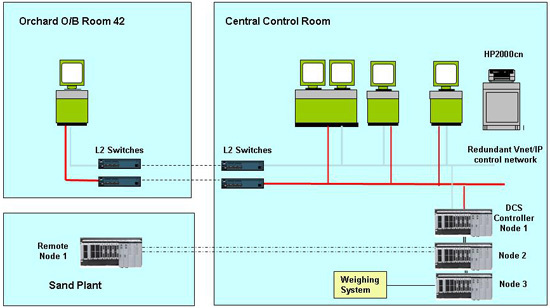 Yokogawa United Kingdom successfully installed this system within a short period of time. Due to the age and condition of the legacy system, the project team could not find the existing system configuration and detail specifications by proper documentations. However, by working through the system one section at a time, Yokogawa and Lucite engineers were able to collect all of the configuration data and transfer it to CENTUM VP. This approach allowed Yokogawa to develop an excellent relationship with the Lucite project team and gave Lucite confidence in Yokogawa's capabilities as a solution provider. As a result of careful planning and preparation, the project team was able during a short 14-day plant shutdown period in September 2008 to remove the PlantScape system and install, start up, and commission the new CENTUM VP system. The overall competency of Yokogawa's engineering team, particularly in the area of batch applications, was well appreciated by the Lucite project team. The CENTUM VP Batch package can handle everything from recipe management to batch report handling and unit management. Its capabilities are superior to those of the system that it replaced, and it is much easier for the Lucite engineers to use, ensuring error-free batch operations. The package has a function that shows the operation procedure, current step, and current phase during normal operations, ensuring very high production efficiency and safe operation. In addition, the ergonomic design of the CENTUM VP human machine interface (HIS) helps improve operation efficiency. Lucite is very happy with the high reliability, availability, and flexibility of the CENTUM VP system, and has experienced no major system failures since this system was started up in the fall of 2008. Integration with the weighing system in use at this plant is very important for batch operations. The weighing data is essential for the tracking of batch operations and management of raw materials. Data from the weighing system is received via a Profibus interface. An operator can monitor this on a graphic display and confirm its status before starting a batch operation. The visualization of all operation data helps improve quality. Ray Jones, a Technology Manager, had the following to say about the new system: "Yokogawa's CENTUM is a very flexible system and easy to use. Settings for control strategy changes, recipe settings for new products, and other modifications can be easily configured from an engineering station in the engineering department." Mr. Jones added, "We are planning to upgrade the existing safety system and to integrate all systems in our plant for safer operations and more sustainable manufacturing. We have a five-year engineering service contract with Yokogawa and are working closely together with them." The CENTUM Batch package provides powerful, scalable solutions for continuous, batch, and hybrid applications. This package complies with the ISA-88 and IEC-61512 batch control standards and provides recipe management, process management, and unit supervision functionality. 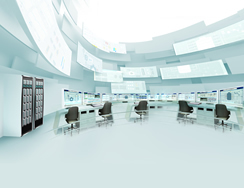 It complements the field proven CENTUM VP system, which features completely redundant real-time controllers offering an availability of 99.9999999 percent ("seven 9s"). The batch recipe management, scheduling, and production information management functions can also be easily integrated into manufacturing execution systems (MES) and supply chain and enterprise management systems to meet the rising need for leaner and more agile manufacturing operations. CENTUM VP has a simple and common architecture consisting of human machine interfaces, field control stations, and a control network.